Given the high costs, complexities and long lead times associated with Card brand EMV certifications and PCI compliance, Charge Anywhere’s EZ EMV SDK is easy to implement, cost effective and offers speed to market. With implementations for fully or semi integrated solutions, we provide developers and integrators with the tools to remove them from the scope of PA DSS compliance and EMV/Chip card certifications as card data never enters the POS application. For existing mobile applications, our Semi Integration option is the best way to add EMV without requiring PA DSS and EMV certification. Your POS app sends the transaction information to Charge Anywhere’s app on the same device. The customer completes the EMV transaction on the Charge Anywhere’s app. The payment app sends the transaction to the ComsGate gateway and updates the mobile app when it receives the response. Our Cloud Integration option is the easiest way to add EMV to existing POS systems without requiring PA DSS and EMV certification. 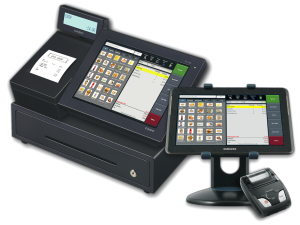 Your existing POS system sends a message over the Internet to Charge Anywhere with transaction information. A separate mobile device with provided card reader runs the Charge Anywhere cloud app. The customer completes the EMV transaction on the tablet and Charge Anywhere sends the results back to your POS application. Charge Anywhere’s EMV SDK Integration option for Android phones and tablets is the most flexible way to fully embed EMV transactions into your existing POS system. Using the Charge Anywhere EMV SDK, you program your POS system to communicate directly with the ComsGate gateway. While more upfront work than our other solutions, you have total control over your EMV integration. This option requires PA DSS and EMV certification.